That I might be on a slight bold makeup- cateye kick... I got so much amazing makeup for Christmas that I am finding every excuse possible to wear all my goodies. These are a few random makeup looks I've done recently that I wanted to share with you guys! In some eventuality these posts will become a "dedicated post". Meaning I will only be covering a full "FOTD" instead of several looks in one post (unless you guys like this better). To see some closeups of these eye looks, some full face shots and my new hair just continue reading! Are you Givin' Me the Lip? LOL.. Ok So I am pretty petrified about this post. I have no idea why.... It's mah mouf! 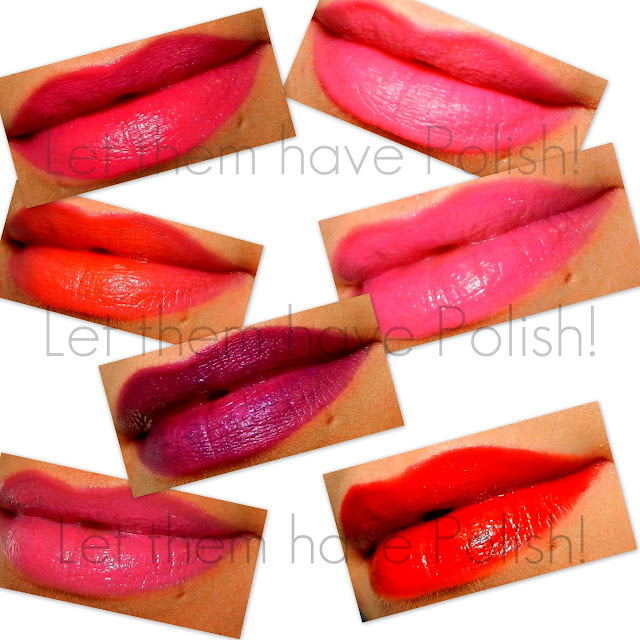 Remember a while back when I did [THIS] Milani lippy post? I showed arm swatches because at the time I was just NOT into lipstick, or just plain intimidated by it I suppose. That very day I resolved to get over that silliness. I started experimenting with lippies and practicing my application, taking photos, etc. I realized that a nicely done lip really does complete "the look". I've also found confidence in bold lips. All of a sudden I don't feel right unless my pout is coated in bright color. I find that I feel most comfortable in BRIGHT shades in the Pink family, but I have been expanding to Red's and even Plums. SO! I wanted to share with you guys some random lippy swatches to start getting comfortable with doing these types of posts. To see some lippy closeups just continue reading ♥.